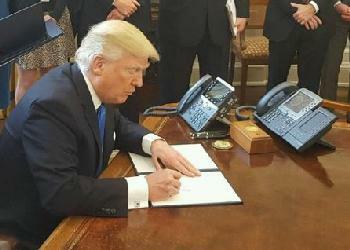 WASHINGTON, DC, January 30, 2017 (ENS) – Framing it as a “prudent and financially responsible” measure, President Donald Trump today ordered federal agencies to repeal two existing regulations for every new regulation issued. Environmentalists warned the order will dismantle protections. Congressman Mick Mulvaney of South Carolina, Trump’s pick to head the Office of Management and Budget, has yet to be confirmed. The executive order is aimed at cutting federal regulations, one of Trump’s top campaign promises. Trump met with small business owners at the White House before signing the order. He said, “We want to make … life easier for small businesses.” Trump said it would also help large businesses. “The public will feel the impacts of this harmful EO right away,” warned Robert Weissman, president of the nonprofit Public Citizen. Environmental groups lost no time in taking aim at the new requirement, which they said will dismantle environmental protections. “This new policy is as dumb as it gets,” said Kieran Suckling, executive director of the nonprofit Center for Biological Diversity, which plans to fight the order. “Judging a regulation based solely on its costs, without considering benefits, is illogical. Yet the order makes no mention of accounting for a regulation’s benefits, which are often carefully quantified by the issuing agency,” said Revesz. “The executive order’s separate requirement that all regulations’ costs in a given fiscal year must sum to zero, regardless of their benefits, is similarly arbitrary and dangerous,” he said. The wording of this executive order could cause confusion and chaos, he said. White House chief of staff Reince Priebus sent a memo to agency heads on Inauguration Day, January 20, advising them not to issue any more regulations. But it is unclear how the one-for-two executive order applies to new rules that federal agencies are legally required to issue, or how it will treat deregulatory actions. Since the Reagan administration, presidents of both political parties have worked to improve the quality of federal regulatory decisionmaking. In particular, the Office of Information and Regulatory Affairs has promoted what Revesz called “sophisticated analytical methods” to ensure that regulations are properly vetted and that they will move forward only if their benefits to society justify their compliance costs. “Regulations help improve the quality of life for Americans: they ensure food safety, protect clean water, and make airplanes and cars safer. Making regulations more efficient and less costly is a worthy goal, but this executive order will not help achieve it. Instead, this order will likely hurt the American public and hinder the functioning of the government. The Center for Science in the Public Interest, CSPI, is a nonprofit health advocacy group based in Washington, DC, that focuses on nutrition and food safety policies.